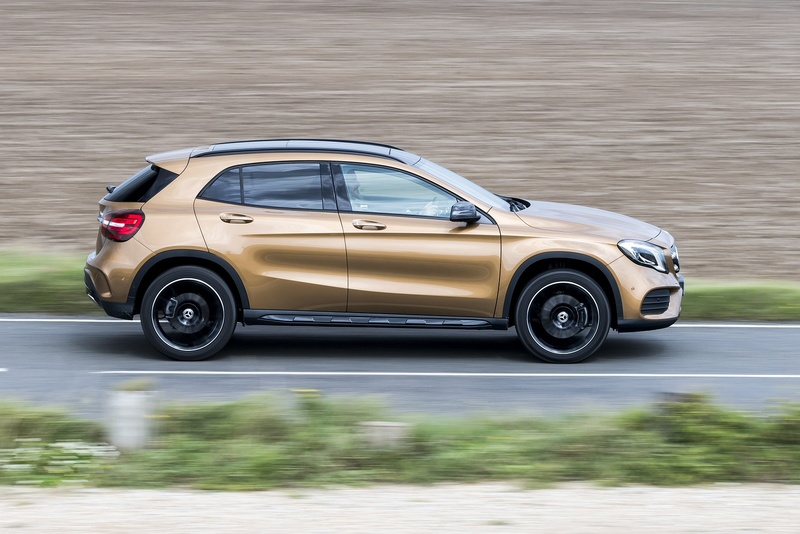 Imagine a Mercedes A-Class hatch with a little extra practicality and a more adventurous outlook and you'll have this car in mind, the brand's GLA compact Crossover. It's the brand's answer to more premium offerings in this growing fashion-conscious segment and has been engineered with the kind of thoroughness you'd expect from the Three-Pointed Star. Let's check out this model in lightly revised form. Mercedes calls this the enry point into its SUV line-up but in fact, the GLA isn't really any kind of proper SUV. Instead, it targets customers who like the idea of a Qashqai-class family-sized Crossover but want it with a slightly more prestigious badge. The car was launched in 2013 and specifically targets BMW's X1 and, even more directly, Audi's Q3. Under the skin, it's almost idenical to a Mercedes A-Class compact hatch, yet boasts the rugged-ised looks and slightly higher ride height that Crossover buyers like so much. 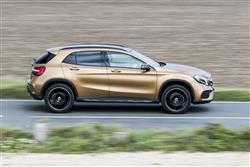 With competition strengthening in this sector, Mercedes has boosted the GLA's appeal with minor exterior styling changes that include the availability of full-LED headlights. And embellishments to the cabin that offer a classier feel. More significantly, an offroad 'comfort' suspension package that raises the car by 30mm now comes as standard. A car that essentially is a family hatchback is likely to have the dynamic aptitude of a family hatchback. A model that, in contrast, is designed as a proper RAV4 or CR-V-style compact SUV is never going to feel as sharp, no matter how compromised its Rubicon Trail pretensions might be. 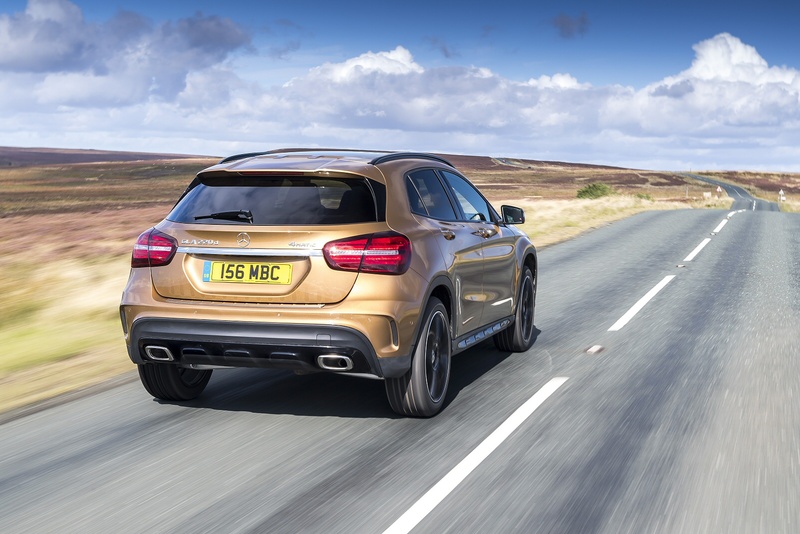 So if you like your driving, you'll give thanks that this GLA isn't setting out to rival RAVs - or indeed Audi Q5s, BMW X3s or Range Rover Evoques come to that. Mercedes has designed a C-Class-based GLC model to do that. That frees this car to be a proper Qashqai-class compact Crossover. Or, to put it another way, to offer pretty much all the handling brio you'd get from the A-Class hatch it's designed upon, with pretty much none of the downsides, these being mainly centred on an over-firmed ride here replaced by something much more supple. When it comes to drive traction and transmission, much will depend on engine choice. The cheapest GLA 200 derivative uses a 115bhp 1.6-litre petrol engine but for the UK, the emphasis is firmly on a 2.1-litre diesel line-up that begins with the 136bhp GLA 200d. You'll need this variant if you want the choice of auto or manual transmission since it's an auto-only regime further up the range and you'll have to have a self-shifting 'box if you take up the option of auto transmission. 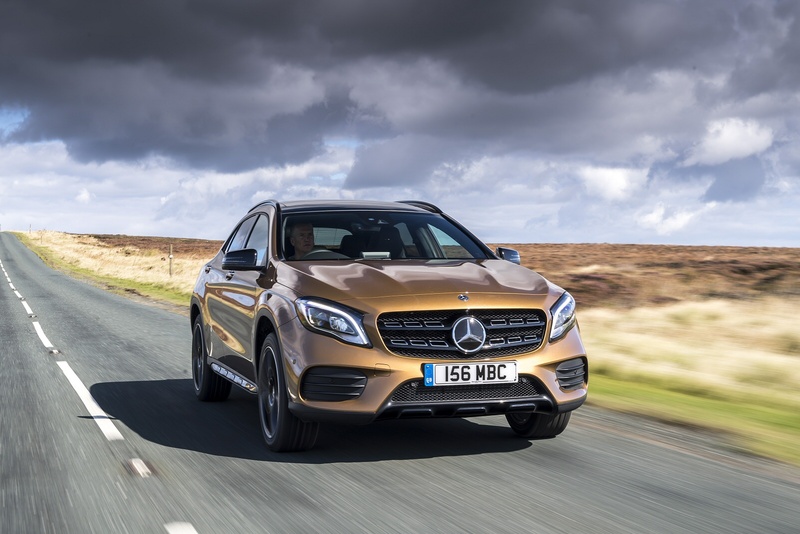 Should you wish for more performance than that, you'll probably find yourself ending up in the GLA 220d 4MATIC diesel derivative that many customers choose. With 177 braked horses to call upon, this version has a useful extra turn of speed, dispatching the 62mph benchmark in 7.7 en route to 135mph, despite having the carry around the extra weight of 4WD hardwear that can send up to 50% of the engine's power to the rear wheels for improved cornering exit traction. The 211bhp GLA 250 petrol variant also takes the auto 4MATIC route and should feel pleasantly rapid, delivering 62mph in 6.6s on the way to 143mph. Rather more than pleasantly rapid is the frankly certifiable GLA 45 AMG, a car that now rocks up with 381bhp beneath its bonnet. 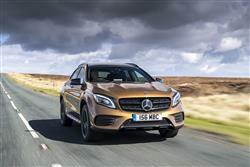 Its 2.0-litre petrol engine and 4MATIC all wheel drive catapult you to 62mph in just 4.4 seconds. 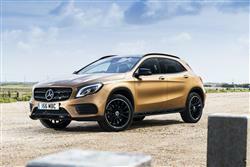 Though Mercedes sees this GLA as part of its SUV portfolio, there's nothing very SUV about the way it looks. It's probably better to simply see this as an A-Class with an added dose of attitude, a role much closer to its comfort zone thanks to a raked-back windscreen and a front end that sports big air intakes, neat flutes in the bonnet and smart smeared-back headlights. Changes made to this revised model include modified bumpers, smarter alloy wheels and the option of full-LED headlights. As before, smart GLA-specific touches include the way the stylists have teased out the wheel arches, adding muscularity to the look. And the sleek integration of the standard aluminium roof rails. Drop inside and you'll find a cabin that in this revised model has been upgraded with higher quality seat coverings, smarter trim and chromed control panels, plus there are re-styled instrument dials. Otherwise, it's as you were, which means that, depending on the suspension chosen, you can find yourself sitting up to 80mm higher than you would in a comparable A-Class model. That means quite a commanding view out-front from a driving position easily perfected by wide adjustment possibilities for seat and steering wheel aided by plentiful head and shoulder room. The cabin architecture of all Mercedes' smaller models is pretty much identical these days, which fortunately is no bad thing in terms of what you end up with here. So, as with any A or CLA-Class model, you get the same deeply-cowled twin-dial instrument binnacle viewed through a lovely, grippy nappa leather-trimmed three-spoke multi-function steering wheel. There are the same five chrome-trimmed SLS supercar-style air vents decorating a dash split into upper and lower sections. The upper part's dominated by the iPad-style 5.8-inch free-standing infotainment screen that's been stuck in the middle of it, controlled by a little rotary dial positioned where the handbrake would normally be if it hadn't been replaced by one of those fiddly electronic ones with a switch hidden away beneath the fascia. Out back, you get 481-litres of luggage space, a big jump up from the 341-litre total offered by the A-Class and around 60-litres more than you'd get in an Audi Q3. Mainstream GLA buyers looking at 2.1-litre diesel and 2.0-litre petrol models will need a budget starting from around £26,000 to £27,000 and ranging up to around £38,000 for mainstream models. Dedicated followers of the brand though, can consider paying up to around £47,000 for the Mercedes-AMG GLA 45 4MATIC flagship version. The base GLA 200 CDI diesel variant is offered in 2WD or 4MATIC form and comes with the choice of manual or automatic transmission. Further up the range, you have to have automatic transmission and 4MATIC 4WD. For diesel folk, there's a premium of just around £1,400 to go from a GLA 200d 4MATIC auto to a comparably specified pokier GLA 220d 4MATIC auto variant - like the one we tried. That sounds reasonable given that the extra cash gets you quite a lot of extra performance. Running costs do also rise quite significantly with this pricier model though, so make sure you've taken that into account. If, having considered all of that, you conclude that it is a GLA model you really want, then you're going to need to know what's included in the asking price. And the answer is a very reasonable spec. Even in least expensive SE trim, you get 18-inch alloy wheels, aluminium roof rails, privacy glass, a chrome-trimmed twin-pipe exhaust, rain-sensing wipers and a reversing camera. Inside, there's man-made Artico leather for the seats and the real nappa stuff trimming the multi-function steering wheel, plus air conditioning, a trip computer and a DAB radio with Bluetooth, USB and Apple iPod connections. Standard safety stuff includes 'ATTENTION ASSIST' and 'Active Brake Assist' autonomous braking. Mercedes has worked extremely hard to make this GLA one of the cheapest cars to run in its class, efforts aided by the fact that all the engines on offer feature direct injection and turbocharging, plus an ECO start/stop system that cuts the engine when you don't need it, stuck in traffic or waiting at the lights. There's also an ECO setting for the 7G-DCT 7-speed automatic gearbox, a slippery 0.29 Cd drag factor, plus intelligent management of engine ancillaries like the alternator, the oil feed and the water pump and low rolling resistance tyres. As a result, it's hard to argue with the numbers generated by this GLA, figures that aren't very different from those of its Mercedes A-Class design stablemate, despite this car's extra 40kg of weight. Manual or automatic, the entry-level GLA 200d delivers the sort of returns more usually associated with a supermini - 67.3 miles from a gallon of diesel on the combined cycle and around 110g/km of carbon dioxide. Even the pokier GLA220d 4MATIC we tried returns 56.5mpg and emits just 130g/km. If you�re looking for a new Mercedes-Benz GLA 200 SE 5dr Petrol Hatchback for sale, you�ve come to the right place. 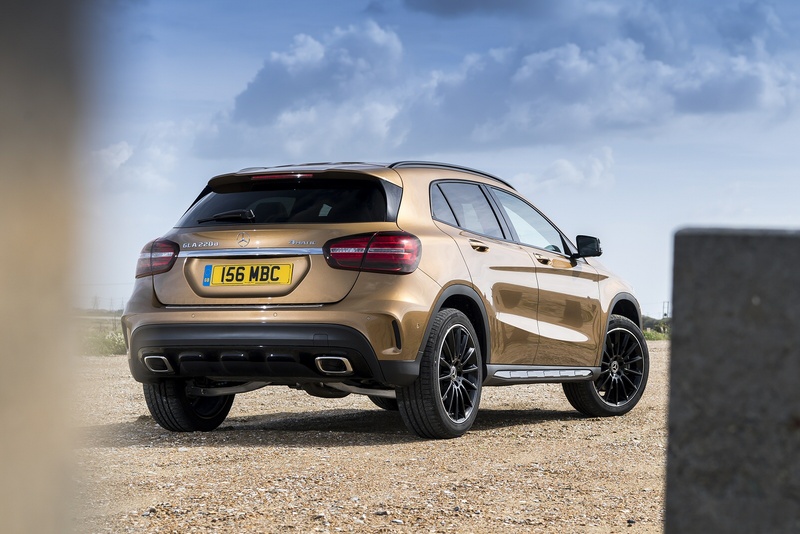 At Bristol Street Motors we don�t just have the best Mercedes-Benz GLA 200 SE 5dr Petrol Hatchback deals, we also offer friendly advice and help with all your enquiries to ensure your buying experience is a happy experience.